So, eggnog is pretty much the most unvegan drink there is, no? Even Beefmato has some veggie content. We’re getting off topic now… Point is, we picked up some Silk Soy Nog this weekend to see what the vegan version of this uber-festive drink was like. Our initial thought upon pouring a glass of it was that it seemed thinner than regular eggnog. Odd, as if there is one thing we can normally count on, it’s soy milk being just a smidgen thicker than we’d like. We continued on. The taste: not quite as strong as we’d like. Double odd, as if there is a second thing we can normally count on, it’s soy milk having just a smidgen too strong of a taste for us. That being said, when it comes to a beverage, we’d much rather err on the side of too thin and not enough flavor, so we can’t complain that much. The flavor itself was not bad, not bad at all. We just wish there was a little more of it. 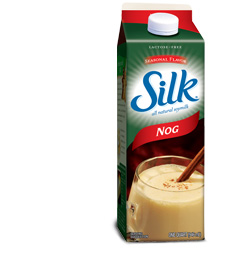 With that, Veganewbie awards Silk Soy Nog a Kick It Up a Notch and Get Back To Us. 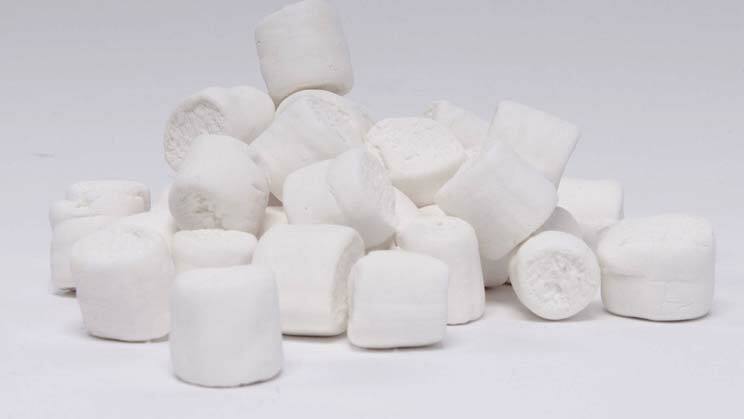 If you’re like us, you mourned the loss of marshmallows upon going vegan and gave a solid hip-hip-hurraw upon learning that there were such things as vegan marshmallows. Yes, life got a little less bleak upon discovering Dandies Vegan Marshmallows at our local grocery. Unfortunately, they’re not quite as spot-on as we dreamed. Yeah, yeah, we know – you have to sacrifice things sometimes when you’re vegan. If Dandies are any indicator of all vegan marshmallows, this is one of those times. They’re almost sickeningly sweet at not nearly as fluffy as we’d like. Granted, it’s been a while since we’ve had those crazy, orange circus peanut candies, but that’s what they remind us of. Ah well, you can’t win ’em all. And with that, we award Dandies Vegan Marsmallows a Nice Try, But Not Quite the Real Thing. That being said, give them a shot – just don’t get your hopes up too much. The Veganewbie team has recently been on a mission to find the very best in homemade ice cream recipes. Our documentation along the way has been minimal at best, so excuse us if we gloss over some of the details and cut to the chase. Contender One – One of those recipes calling for coconut milk. Result – How can one even call it vanilla ice cream when it tastes overwhelmingly like coconut? And the consistency? Not great. Contender Two – One of those recipes calling for tofu. Result – OK, but lets just say there’s a solid half gallon of this still sitting in out freezer waiting to be thrown out. Contender Three – Wheeler del Torro’s recipe from The Vegan Scoop. Results – Now THIS is what we’re talking about!! Good consistency. Good taste. Finally, something that tastes comparable to the non-dairy ice creams that grocery stores expect us to pay $5 a pint for. Since One and Two aren’t even worth bothering in comparison, we’ll skip right to the chase and cover Three. For a video tutorial of the recipe and a variation, visit Everyday Dish TV or for even more recipes from Wheeler, buy The Vegan Scoop. In a small bowl, combine 1/4 cup soy milk with arrowroot and set aside. Mix the soy creamer, remaining 3/4 cup soymilk, and sugar together in a saucepan and bring to a boil over low heat. When the mixture begins to simmer, take off heat and immediately pour in the arrowroot cream. This will cause the liquid to thicken noticeably. Update: Do yourself a favor and double this recipe. It really doesn’t make nearly enough. What exactly does that mean? Well, we here at Veganewbie know how stressful it can be to think about a big vegan holiday dinner when you haven’t done one before. And even if you have, who can’t use a fresh idea or two? So from now until Thanksgiving, we will be scouring the webs for the tastiest there is in vegan Thanksgiving dishes and bringing them straight to you. It’s happening here and on Twitter, so be sure to follow us @Veganewbie. Today, we found ourselves face to face with a vegan Boca burger or, as we call it, Del Boca Vegan*. Let’s be honest here, folks, Boca is not typically an uber-popular product line. Their classic burgers remind us of the the school lunch hamburgers from our elementary school days, a fact we both love and hate them for. Still, we were curious and hungry. Our initial reaction is that the color was sort of weirdly pale. Yet we ventured on. Burger heated. Tomato, onion, vegenaise, mustard, and ketchup: check, check, check, check, and check. Nibble, nibble, chomp, and suddenly our burger was gone. Picture those old Tootsie Roll Pop commercials. It was a lot like that. Seeing as how we scarfed it down before we were able to take even the slightest of notes about it, we feel that the vegan Boca burger has earned the Veganewbie Seal of Approval. Way to be, Boca. *Joke included against advisement and better judgment. So, it’s World Go Vegan Week. As far as I’m concerned, we might as well call it World Veganewbie Week. Come on, people, this is OUR WEEK! Check out what’s going on in your community to celebrate, and goooooooo vegan! 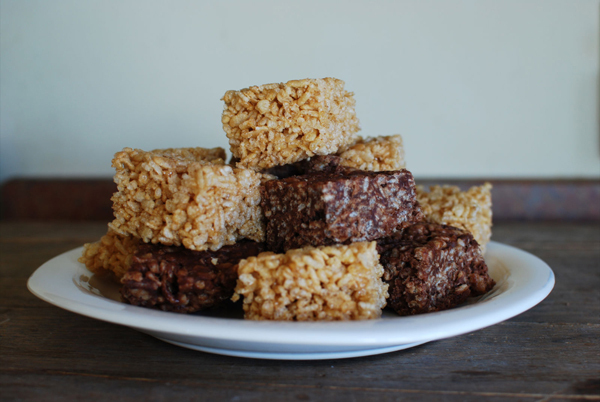 It was a vegan rice crispy treat showdown at Veganewbie headquarters this weekend. These things happen when there are two recipes for one of our most favorite non-vegan treats and we simply cannot decide which one to try first. Now, I know what you’re thinking here. These recipes are not exactly going for the same treat end result. It is sort of like comparing apples and oranges (make that comparing maple syrup and brown rice syrup to chocolate and peanut butter). Still, as big fans of both the regular and chocolate versions of the classic non-vegan treats, we felt confident that we could come up with a clear winner. With recipe #1, we have Isa Chandra Moskowitz and Terry Hope Romero at works, two vegan geniuses that have never let us down yet (seriously, if you don’t own at least one cookbook by either of these gals, do yourself a favor and go buy one). Also, it has butter in it, and isn’t that sort of necessary? Then again, it has maple syrup, of which we are not huge fans. With recipe #2, 4 words: chocolate and peanut butter. This could be close. Day one left us undecided. They were both pleasantly delicious. The maple and brown rice syrup treats had a taste surprisingly like the classic, marshmallowy version. They weren’t gooey like you’d get with marshmallows, but when going vegan, you can’t always have it all. Meanwhile, the chocolate peanut butter treats were sweet and rich and oh, so yummy. Maybe this was going to be harder than anticipated. Cut to day two….While one of the treats kept their original consistency, one had softened overnight into something very uncrispy-like indeed. A winner was clear. So, without further adieu, Veganewbie is proud to announce the victor of Battle: Vegan Rice Crispy Treats – Vegan Cookies Invade Your Cookie Jar! Well done, Isa and Terry, well done.